Marking this year’s National HIV Testing Week (NHTW, 21st November), the HIV awareness-raising charity Saving Lives, in collaboration with Birmingham Heartlands HIV Service, are launching www.HIVTestUK.com, an innovative free postal HIV testing service. “We need to encourage people to GET TESTED,” he says. “HIV Testing saves lives, it’s as simple as that. And now the charity has made it easier than ever for people to get tested. “Around one in 5 people infected with HIV in the UK don’t know they have it, which means they could be getting ill and passing on the virus without knowing it. The charity’s ambassadors will take to social media during testing week to encourage people to #GetTested for #HIV, and tweeting to @savinglivesuk. Saving Lives is the first UK-based HIV charity to receive such widespread endorsement from so many professional footballers and celebrities – who also include four-time super middleweight world champion, Carl Froch, England and West Bromwhich Albion Striker, Saido Berahino and England ladies players, Claire Rafferty and Carly Telford. The charity’s ambassadors will be appearing in promotional materials during NHTW to raise the profile of a campaign designed to raise awareness and increase take-up of postal HIV testing. The offer of free postal testing is set to coincide with NHTW from 21st November until the end of World AIDS Day (1st December). Saving Lives hope to increase awareness and encourage more people to get tested. Latest statistics show that the number of people living with HIV in the UK has doubled within the last 10 years, with an estimated 103,700 people living with the condition. Of these, between 17 -20 percent (1 in 5) are undiagnosed and do not know about their HIV infection. This is mainly because symptoms may not usually appear for many years, after which treatments have less successful outcomes. In contrast early detection, and modern medicines, allow people to have a normal life expectancy – highlighting the reason why getting tested is so important. 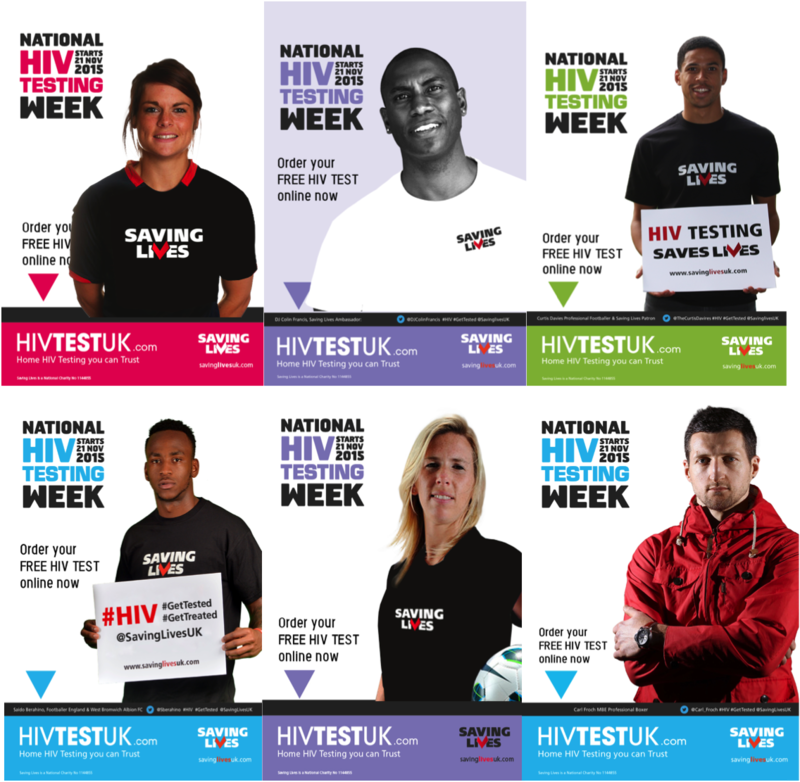 Anyone can request a HIV self-sampling kit during NHTW by visiting www.HIVTestUK.com. Using detailed how-to videos provided on the website, recipients will be able to take a blood sample at home and send the completed kit back to the Heart of England’s state-of-the-art laboratories for analysis. It is the only service in the UK that offers users direct access to NHS quality self- sampling testing HIV kits, expert analysis and a unique aftercare service. Nearly ten years ago, Lizzie Jordan became a mother, a widow and HIV positive all within an 18 month period. “HIV positive Testing is crucial; she says; being aware of your status early enables you to help yourself. Do it – get tested and you can protect your long term health and live a full life. “Being aware of my own HIV status has given me the opportunity to look after myself and access medication before my immune system could be irreversibly damaged. If my partner had been tested and made aware of his status, he may still be here today. Tom Hayes, Saving Lives Ambassador, who was diagnosed with HIV in 2011, welcomed the test. More information on HIV and HIV testing can be found at Free postal HIV testing kits can be ordered online at www.HIVTestUK.com. For more information about HIVTestUK, contact Dan Hartland at dan.savinglives@gmail.com.